Bryn Llewelyn Guest House Guest HouseBryn Llewelyn is a friendly guest house in the centre of the village of Betws y Coed Snowdonia and within easy walking distance for restaurants, pubs and shops. Bryn Llewelyn Guest House has a private car park for guests and free WiFi is also available. Bryn Llewelyn is a friendly guest house in the centre of the village of Betws y Coed Snowdonia and within easy walking distance for restaurants, pubs and shops. 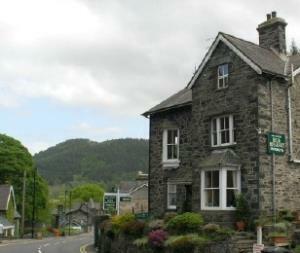 Bryn Llewelyn Guest House has a private car park for guests and free WiFi is also available. Come and experience a warm welcome in Wales. Bike storage. Hairdryer on request. Drying facilities. From the South entering the village on the A5 over the Waterloo Bridge, the village green will be on your right hand side. We are situated about 300 metres past the green, opposite the last shops on the right - Trespass and Field & Trek. From the North entering the village on the A5, soon after the 30 mph speed signs, the very first building on the left hand side is a shop called Field & Trek we are directly opposite.